Background: Human leukocyte antigen-E (HLA-E)is a non-classical major histocompatibility complex (MHC) class I antigens which expressed on extra villous cytotrophoblast, which interacts with NKG2A, is an inhibitory receptor on natural killer (NK) cells and leading to down regulation of immune response in the maternal-fetal interface and provides maternal immune tolerance of the fetus. Objective: This study was designated to investigate the gene frequencies of E0101 and E0103 in HLA-E gene in Iranian women with recurrent spontaneous abortion (RSA). 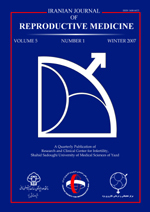 Materials and Methods: Amplification Refractory Mutation System (ARMS-PCR) technique was carried out to detect polymorphism in exon 3 of the HLA-E gene in women with RSA and controls (n=200). Differences between groups were analyzed by SPSS19 software using χ2 test. Results: There was no significant difference in the allele frequencies of the HLA-E polymorphism between RSA and fertile controls but HLA-E 0101/0103 heterozygous genotype was found to be significantly higher in RSA group (p=0.006, OR=1.73), so this genotype might confer susceptibility to RSA. Conclusion: Our results suggest that HLA-E 0101/0103 heterozygous genotype leads to increase of RSA risk. It seems that by genotyping of HLA-E polymorphism, we can predict the risk of RSA in infertile women.